Sustanon is a mixture of various testosterone esters, first developed and released as a means of hormone replacement therapy with insufficient secretion of endogenous testosterone. Currently, almost all mixtures of testosterone esters equate to Sustanon. 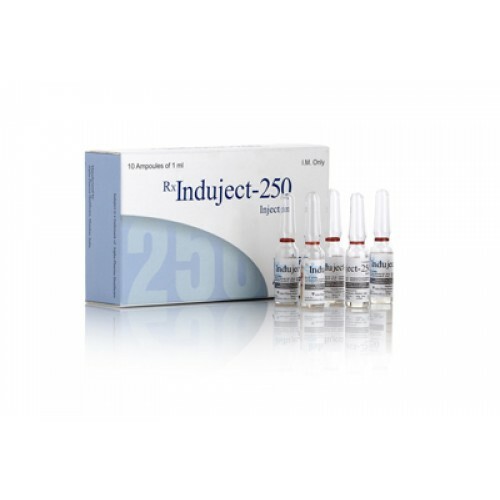 Induject-250 (vial) is an injectable mixture of testosterone esters. This preparation contains: testosterone propionate, testosterone phenylpropionate, testosterone isocaproate, testosterone decanoate. It was specifically designed for fast and at the same time long acting. Like other testosterone products, Induect 250 mg is a strong anabolic steroid with a pronounced androgenic component. Strengthening blood formation – an increase in the number of red blood cells in the blood provides better oxygen transport, thereby increasing endurance. The time of detection of the drug – up to 3 months. Due to the fact that the mixture Induject Testosterone 250 mg is a strong androgen, we can expect increased activation of the skin glands, blackheads, fluid retention in the body, increased hair growth on the body and face. To prevent this growth, you must use proscar (finasteride). Sustanon (Induject) 250 suppresses endogenous testosterone production — which is why you should use gonadotropin or clomid. Nandrolone – to gain muscle mass. Winstrol or trenbolone – for relief. Combining can reduce the frequency of side effects and improve the effectiveness of the course.